Although NK cells are classified as innate immune cells, recent studies have demonstrated the transformation of NK cells into long-lived memory cells that contribute to secondary immune responses in certain mouse models. However, whether NK cells mount an Ag-specific memory response to acute influenza virus infection has not yet been examined. Here, we show that, consistent with previous studies, lung NK cells play an important role in controlling viral proliferation after primary influenza virus infection. However, although lung NK cells display a memory phenotype at the late stage of infection, these cells do not protect mice against secondary influenza virus infection. Interestingly, liver NK cells from influenza virus–infected mice possess a memory phenotype and protect mice against secondary influenza virus infection. Memory-like liver NK cells display a CD49a+DX5− phenotype, and the adoptive transfer of purified liver CD49a+DX5− NK cells into naive mice followed by viral infection results in protective immunity and decreased viral titer. Moreover, we demonstrate that primary inactivated influenza virus induces memory NK cells residing in the liver of Rag1−/− mice. Collectively, these data suggest that liver CD49a+DX5− NK cells remember encountered Ag from influenza virus after primary infection and are more protective upon subsequent infection. Immune memory is a feature of the adaptive immune system. However, recent studies have demonstrated that NK cells, important components of the innate immune system, also mediate Ag-specific recall responses, similar to T and B cells (1–4). Three major viewpoints of NK cell memory initially arose from the studies of NK cell memory to recall to skin contact hypersensitive chemical hapten and noninfectious virus-like particles (1, 2), cytokines (3), and mouse CMV (MCMV) (4). In chemical hapten-induced contact hypersensitivity (CHS) mouse models, RAG-deficient mice lacking T and B cells exhibit CHS responses elicited through hapten exposure, and hapten-specific memory-like NK cells typically reside in the liver and display a CD49a+DX5− phenotype (1, 2, 5). Using noninfectious virus-like particles, Silke Paust and colleagues showed that liver NK cells remember influenza virus, vesicular stomatitis virus, and HIV, and memory NK cells provide effective and specific protection against these viruses. However, the sensitization of NK cells to influenza A virus does not require NKp46-hemagglutinin (-HA) interactions. With respect to cytokine-induced memory-like NK cells, Cooper et al. have shown that the response to restimulation ex vivo either with cytokines or through their activating receptors Ly49H or NK1.1, indicates IFN-γ production is more robust than resting NK cells (2, 3). This enhanced response could be detected even 3 wk after transfer into naive hosts. Using an MCMV infection mouse model, Sun et al. (4) demonstrated that NK cells bearing the Ly49H receptor specifically recognize MCMV-infected cells expressing the viral glycoprotein m157 and eventually form MCMV-specific immune memory. Together, these studies demonstrate the existence of NK cell memory. Moreover, memory NK cells mediate an effective protection against vaccinia virus (6) and HSV-2 (7) in the absence of T and B cells. More recently, robust, durable, Ag-specific NK cell memory can be induced in primates after both SIV (8) infection and Ad26 vector vaccination. Therefore, there is mounting evidence for memory NK cell memory response in different models of viral disease in both mice and primates (9, 10). As more pathogen components recognized by NK cell receptors, including activating and inhibitory receptors, are characterized (11, 12), additional infectious disease models, especially natural pathogen infection mouse models, will be required to further analyze the mechanisms underlying NK cell memory formation during infection. Influenza virus infection is a common respiratory disease. The first line of defense against influenza virus infection is mediated by the innate immune system, which controls the initial response to viral infection and regulation of the adaptive immune response (13, 14). As an important part of the innate immune system, NK cells have a higher frequency in the lungs than in any of the other tissues (15, 16). Most of the data from animal models suggest that NK cells may be directly antiviral, and able to recognize and kill virus-infected cells through interactions with influenza hemagglutinin and the receptor, NKp46 (17–19). However, NK cells can also contribute to pathological damage of host tissues with high dose influenza infection (20, 21). These studies raise the interesting possibility that NK cells may play dual roles during influenza infection, conferring protection or inducing pathology, depending on the viral dose. Whether memory NK cells can provide protection against subsequent influenza infection and the related immune mechanisms is poorly understood. Thus, a live influenza virus infection mouse model might provide an adequate platform to study the immune memory of NK cells. In the current study, to determine whether NK cells could mount an Ag-specific memory response to acute respiratory influenza virus infection, we first explored the existence of memory-like NK cells after viral infection and subsequently characterized the phenotype, function, and location of memory-like NK cells. We observed that influenza virus infection–induced memory-like NK cells share similar phenotypes with MCMV-specific Ly49H+ memory NK cells. Similar to hapten-specific memory NK cells, memory-like NK cells induced through influenza virus infection also reside in the liver, and the adoptive transfer of liver CD49a+DX5− NK cells into naive mice followed by viral infection results in protective immunity and decreased viral titer. Furthermore, primary inactivated mouse-adapted influenza A/PR/8/34 strain (PR8) treatment could protect Rag1−/− mice against secondary PR8 infection–induced death and reduced the viral titer in the lung. Compared with Rag1−/−Tbx21−/− mice that lack CD49a+DX5− liver NK cells, inactivated influenza-treated Rag1−/−Nfil3−/− could resist secondary live influenza virus infection. 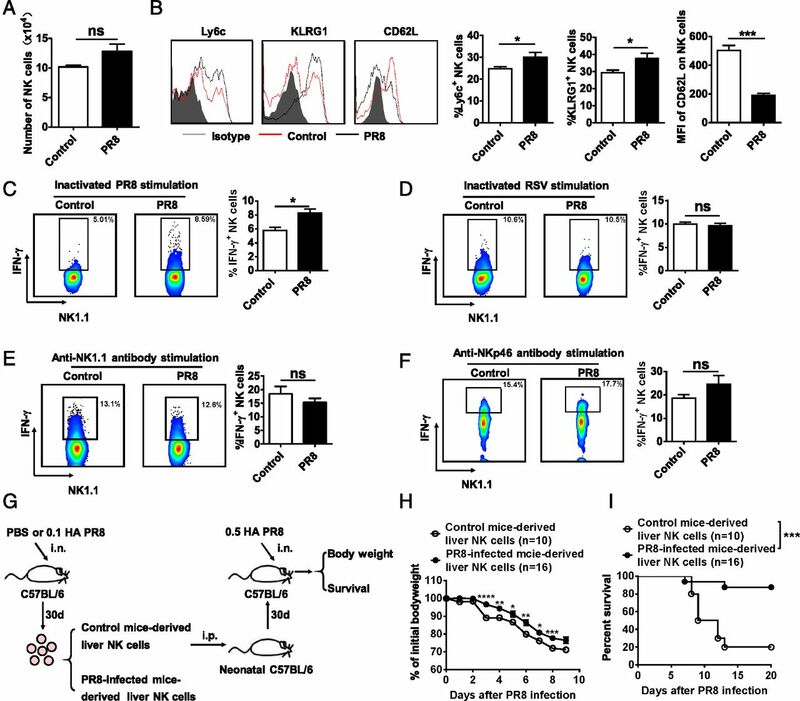 Thus, the results of the current study suggest that influenza virus infection induces the formation of memory-like NK cells, which reside in the liver and protect mice against secondary influenza virus infection, and the live influenza virus infection mouse model might be a new natural pathogen infection mouse model after the MCMV infection model to study memory-like NK cells. C57BL/6 mice (6–10 wk of age) were obtained from the Shanghai Experimental Animal Center (Chinese Academy of Sciences, Shanghai, China). Rag1−/− (B6) mice were obtained from the Model Animal Research Center (Nanjing, China), and these mice were originally obtained from The Jackson Laboratory. Nfil3+/− (B6) mice were provided from Tak W. Mak (University of Toronto, Toronto, ON, Canada). Nfil3−/− mice were bred in house and maintained at an animal facility under specific pathogen-free conditions. Tbx21−/− mice were obtained from The Jackson Laboratory. Rag1−/− Nfil3−/− and Rag1−/− Tbx21−/− mice were crossbred in house. Animal care and experimental procedures were performed in accordance with the experimental animal guidelines of the University of Science and Technology of China. PR8 (H1N1) was a gift from Hong Meng (Institute of Basic Medicine, Shandong Academy of Medical Sciences, China), and this strain was amplified in the allantoic cavities of 10-d-old specific pathogen-free embryonated chicken eggs (Merial Vital Laboratory Animal Technology, Beijing, China). Allantoic fluids were harvested 72 h after inoculation and stored at −80°C until further analysis. The hemagglutination titer of each sample was 10,240 HA units/ml. Virus of the respiratory syncytial virus (RSV) long strain (subtype A) was grown in Hep-2 cells, frozen at −80°C, and assayed for infectivity. In some experiments, the virus was inactivated through incubation in a 56°C water bath for 35 min prior to use for stimulation or immunization (22). C57BL/6 mice were i.p. anesthetized using sodium pentobarbital (50 μg/g body weight) prior to intranasal (i.n.) infection with influenza virus (H1N1, PR8; lethal dose, 0.5 HA; sublethal dose, 0.1 HA) in 50 μl of sterile saline. Control mice received 50 μl of sterile saline alone. Rag1−/− mice were i.n. infected with influenza virus (H1N1, PR8; lethal dose, 0.2 HA; low dose, 0.005 HA) in 50 μl of sterile saline. Rag1−/−, Rag1−/− Nfil3−/− and Rag1−/− Tbx21−/− mice were s.c. injected with inactivated PR8 or PBS in the abdomen on days −30 and −25. After 1 mo, the mice were infected i.n. with influenza virus. The immunized mice were i.v. administered anti-NK1.1 (PK136) or PBS 1 d prior to infection. The viral loads in the lungs were determined through quantitative real-time PCR analysis at the indicated times after PR8 infection. Briefly, total RNA was extracted from whole lung tissue, and cDNA was subsequently synthesized. The viral loads in each sample were calculated through relative quantification, and the ratio of viral RNA to β-actin mRNA 1 d after PR8 infection in wild-type (WT) mice was used as a control. The following primers were specific for the matrix protein of influenza virus (23): 5′-GGACTGCAGCGTAGACGCTT-3′ (forward) and 5′-CATCCTGTTGTATATGAGGCCCAT-3′ (reverse). Alternatively, the infectious viral titers (viral PFU) were determined using a Madin-Darby canine kidney (MDCK) cell determination assay. This method takes advantage of the production of viral nucleoprotein in infected cells for the quantification of viral titers. At various times after influenza infection, lungs were harvested in 1 ml of DMEM (Thermo Scientific, Beijing, China), homogenized, serially diluted, and 200 μl samples were added to 24-well plates containing confluent monolayers of MDCK cells (1.4 × 105 cells per well) for 5–6 h at 37°C. A 1:1 mixture of 2% methylcellulose/2× DMEM plus 10% FCS was prepared at room temperature or 4°C for at least 2 h, and 300 μl of the methylcellulose/medium-mixture overlay was added to each well. The plate was gently shaken from side to side and incubated overnight at 37°C. Subsequently, these cells were fixed and stained with an Ab specific for the influenza virus nucleoprotein. The signal was detected using a secondary Ab conjugated with HRP, which amplifies the signal of the antinucleoprotein Ab. Subsequent exposure to the Trueblue peroxidase substrate (KPL Company) turned only the infected cells blue. The titer in the lung homogenate was determined after counting the number of blue cells in a given area. Each stained cell corresponded to a single infectious unit. The calculation for PFU/ml lung homogenate was PFU/ml = number of spots × dilution/0.2 ml. Mice were i.v. injected with 30 μl rabbit anti-mouse asialo-GM1 (AsGM1) Ab for NK cells depletion 24 h before and 72 h after influenza virus infection. Mice were i.v. or i.p. injected with 200 μg of anti-mouse NK1.1 Ab (clone PK136) 24 h before influenza virus infection. Control mice received 200 μl of PBS alone. NK cells were enriched from C57BL/6 or Rag1−/− mice through negative selection using a mixture of Abs, including anti-CD19, anti-CD4, anti-CD8a, anti-CD5, anti-Gr1, and anti–Ter-119 (Miltenyi Biotec). NK cells were 60–95% pure based on NK1.1 staining. Then, a FACSAria cell sorter (BD Biosciences) was used to purify NK cells or different NK cell subsets. The purity of the sorted cell populations was more than 95%, as determined through postsort flow cytometry. After sorting, ∼2 × 105 or 1 × 106 NK cells were i.p. injected into neonatal mice or i.v. injected into adult Rag1−/− mice ∼1 or 30 d prior to influenza virus infection. What is more, 1 × 105 liver DX5+ NK and DX5− NK cells were sorted from PR8-infected CD45.2+ C57BL/6 mice and adoptively transferred into sublethally irradiated CD45.1+CD45.2+ C57BL/6 or CD45.1+ C57BL/6 mice i.v. The dynamic change of NK cells in the lung and liver from recipient mice were analyzed at the indicated time points (12 h, 4 d, 15 d, and 30 d) after transfer by flow cytometry. Liver mononuclear cells and splenocytes were isolated as previously described (24). Lung mononuclear cells were isolated as previously described, with minor modifications (25). After blocking Fc receptors, single-cell suspensions were incubated with the indicated fluorescently labeled mAbs at 4°C for 30 min in PBS (containing 0.1% sodium azide and 1% BSA) and subsequently washed twice. To assess IFN-γ production, single-cell suspensions were cultured with plate-bound anti-NK1.1 (clone PK136) for 5 h, plate-bound anti-NKp46 (clone 29A1.4, BioLegend) for 5 h, inactivated virus (∼200 μl PR8 or RSV) for 24 h, or 50 ng/ml PMA and 1 μg/ml ionomycin for 4 h in the presence of GolgiPlug (Brefeldin A, BD Biosciences). Meanwhile, the single-cell suspensions without in vitro stimulation were nonstimulation control. The cells were subsequently collected and stained for surface markers. After fixation and permeabilization, the cells were stained with PE-conjugated anti–IFN-γ. The samples were analyzed by using a BD LSR II and FlowJo 7.6 software. All Abs were obtained from BD Biosciences, eBioscience, or BioLegend. Freshly purified NK cells at 1 × 105 per well were treated with inactivated PR8 or RSV overnight in a humidified atmosphere of 5% CO2 at 37°C. Cytokines were determined in cell-free supernatants using mouse Th1/Th2/Th17 cytokine kit (IFN-γ/IL-2/IL-4/IL-6/TNF/IL-17A/IL-10; BD Biosciences) according to the manufacturer’s protocol. Data were analyzed by using BD LSR II and FlowJo 7.6 software. Two-tailed Student t tests were used for statistical analyses. The data were expressed as the means ± SEM, and the data are representative of two to four independent experiments. The log-rank (Mantel–Cox) test was used to evaluate survival rate. All p values < 0.05 were considered statistically significant. As previously reported (16), i.n. influenza virus (PR8) infection promoted the accumulation of NK cells in the lungs during early stages of infection in C57BL/6 mice (Supplemental Fig. 1A). Compared with control mice, lung NK cells upregulated expression of the activating receptor NKG2D, activating marker CD69, and functional molecule IFN-γ after PR8 infection (Supplemental Fig. 1B, 1C). To examine the function of NK cells in controlling influenza virus infection, we used Nfil3−/− mice (26) that lack NK cells in the lung, and we observed that PR8-infected Nfil3−/− mice showed more weight loss postinfection when compared with PR8-infected WT mice (Supplemental Fig. 1D). We also observed higher viral loads in the lungs of Nfil3−/− mice when compared with PR8-infected WT mice (Supplemental Fig. 1E). Furthermore, we treated mice i.p. with PK136 or i.v. with AsGM1 to deplete NK cells before influenza virus infection and found higher viral loads in the lungs from both PK136-treated and AsGM1-treated mice when compared with PR8-infected control mice (Supplemental Fig. 1F, 1G). Taken together, these data suggest that NK cells in the lung are activated and are involved in controlling viral proliferation after primary influenza virus infection. To explore whether memory-like NK cells generated in the lungs after primary influenza virus infection and provided protection against subsequent influenza virus infection, C57BL/6 mice were infected i.n. with a nonlethal dose of PR8. After 30 d, the number of NK cells in the lungs of infected mice returned to normal when compared with uninfected control mice (Fig. 1A). As previously reported, memory NK cells from MCMV-infected mice expressed higher levels of KLRG1 and Ly6C but lower levels of CD62L compared with naive NK cells (4, 27, 28). Consistently, in the current study, the expression of KLRG1 and Ly6C on the surface of lung NK cells was significantly increased, whereas CD62L expression was decreased 30 d after influenza virus infection (Fig. 1B). Thus, lung NK cells from influenza virus–infected mice exhibit a memory NK cell-like phenotype. To determine whether lung NK cells from influenza virus–infected mice possessed memory cell-like functions, we stimulated lung lymphocytes with inactivated PR8 and observed that lung NK cells from PR8-infected mice expressed higher levels of IFN-γ than lung NK cells from uninfected control mice (Fig. 1C, Supplemental Fig. 2A). To rule out the influence of memory T and B cells, we sort-purified lung NK cells from PR8-infected mice (Supplemental Fig. 2B) and stimulated them with inactivated PR8 in vitro. The results also showed that lung NK cells from PR8-infected mice expressed higher levels of IFN-γ than lung NK cells from uninfected control mice (Supplemental Fig. 2C). Further studies showed that lung NK cells from PR8-infected and uninfected control mice expressed similar levels of IFN-γ after stimulation with inactivated RSV (Fig. 1D), anti-NK1.1 Ab (Fig. 1E), or anti-NKp46 Ab (Fig. 1F). Thus, these results suggest that lung NK cells from influenza virus–infected mice possess Ag-specific characteristics, consistent with reports in the memory T cell field (29). To further investigate the memory functions of lung NK cells from influenza virus–infected mice, we sort-purified lung NK cells (Supplemental Fig. 2B) and subsequently transferred 2 × 105 purified lung NK cells into neonatal C57BL/6 mice (7–10 d old). After 30 d, the recipient mice were infected i.n. with a lethal dose of PR8 (Fig. 1G). Although the recipient mice showed a slightly slow weight loss (Fig. 1H), the survival rate of the recipient mice was not significantly increased after PR8 infection when compared with control mice (Fig. 1I). In order to preclude the influence of the number of transferred lung NK cells, we increased the transferred number of lung NK cells from 2 × 105 to 1 × 106, but this still could not protect recipient mice against influenza-induced death (Supplemental Fig. 3A–B). Furthermore, transferring 2 × 105 or 1 × 106 purified splenic NK cells from PR8-infected mice also could not protect recipient mice against influenza-induced death (Supplemental Fig. 3C–D), which means that there were also no memory NK cells existing in the spleen after influenza virus infection. Therefore, although lung NK cells from influenza virus–infected mice possess a memory-like phenotype, they cannot protect mice from death mediated by secondary influenza virus infection. Lung NK cells possess a memory phenotype but do not protect mice against influenza-induced death. (A–F) C57BL/6 mice were i.n. infected with 0.05 HA of PR8. After 30 d, the number of NK cells in the lung was counted (A), the expression of memory markers (Ly6c, KLRG1 and CD62L) on NK cells was determined by flow cytometry (B), and the expression of IFN-γ in NK cells from control and PR8-infected mice was determined by flow cytometry after stimulating with inactivated PR8 (C), inactivated RSV (D), plate-bound anti-NK1.1 Ab (E) and plate-bound anti-NKp46 Ab (F). (G–I) Schematic of experimental design. C57BL/6 mice were i.n. infected with PBS or PR8, 30 d later, 2 × 105 lung NK cells were isolated and adoptively transferred into neonatal C57BL/6 mice (7–10 d), and then the recipient mice were infected with a lethal dose of influenza virus 30 d later (G). Changes in body weight (H) and survival rate of recipient mice (I) were analyzed. Data were pooled from three experiments. Data are expressed as mean ± SEM by a Student t test. Data represent three independent experiments with at least three mice per group(A–F). The log-rank (Mantel–Cox) test was used to evaluate the survival rate (I). *p < 0.05, **p < 0.01. ns, not significant. Liver NK cells have been reported to develop immunological memory against haptens or vaccines containing viral Ags, such as influenza virus, vesicular stomatitis virus, and HIV type 1 (HIV-1) (2). To determine whether respiratory influenza virus infection could induce memory-like NK cells in the liver, we analyzed the phenotype and function of liver NK cells after primary influenza virus infection. Although the number of NK cells in the liver was slightly decreased 3 d after PR8 infection (Supplemental Fig. 4A), the expression of CD69, NKG2D, and IFN-γ was increased in liver NK cells (Supplemental Fig. 4B, 4C), suggesting that liver NK cells were also activated after respiratory influenza virus infection. In order to preclude the possibility that influenza virus entered the liver and activated NK cells directly, we detected the viral titer in the lung and liver after PR8 infection by MDCK cell determination assay. The results showed that influenza virus could be detected in lung but not in liver from day 1 to day 3 after PR8 infection (Supplemental Fig. 4D). Type I IFNs have been reported to promote NK cells to express IFN-γ during influenza virus infection (30, 31). In our study, we found that the level of IFN-α in both bronchoalveolar lavage fluid and serum was significantly increased at the early days after PR8 infection (Supplemental Fig. 4E), which might be responsible for the activation of NK cells in liver during influenza virus infection. Moreover, as expected, the number of NK cells in the liver did not increase 30 d after PR8 infection (Fig. 2A), but liver NK cells showed upregulated expression of the memory-related markers Ly6C and KLRG1 and downregulated expression of CD62L (Fig. 2B). Functional analysis showed that liver NK cells from PR8-infected mice expressed higher levels of IFN-γ than liver NK cells from control mice stimulated with inactivated PR8 (Fig. 2C and Supplemental Fig. 2C). Similar to lung NK cells, liver NK cells from PR8-infected and control mice also expressed the same level of IFN-γ after stimulation with inactivated RSV (Fig. 2D), anti-NK1.1 Ab (Fig. 2E), or anti-NKp46 Ab (Fig. 2F), suggesting that liver NK cells from influenza virus–infected mice also possess Ag-specific characteristics. However, unlike the lung NK cells, the adoptive transfer of liver NK cells from PR8-infected mice protected recipient mice against PR8 infection–induced weight loss and death (Fig. 2G–I). Altogether, these data suggest that respiratory influenza virus infection induces memory-like NK cell production in the liver, which protects mice against secondary influenza virus infection–induced death. Liver NK cells possess a memory phenotype and protect mice against influenza-induced death. (A–F) C57BL/6 mice were i.n. infected with 0.05 HA of PR8. After 30 d, the number of NK cells in the liver was counted (A), the expression of memory markers (Ly6c, KLRG1 and CD62L) on NK cells was determined by flow cytometry (B), and the expression of IFN-γ in NK cells from control and PR8-infected mice was determined by flow cytometry after stimulating with inactivated PR8 (C), inactivated RSV (D), plate-bound anti-NK1.1 Ab (E) and plate-bound anti-NKp46 Ab (F). (G–I) Schematic of experimental design. C57BL/6 mice were i.n. infected with PBS or PR8, 30 d later, 2 × 105 liver NK cells were isolated and adoptively transferred into neonatal C57BL/6 mice (7–10 d), and then the recipient mice were infected with a lethal dose of influenza virus 30 d later (G). Changes in body weight (H) and survival rate of recipient mice (I) were analyzed. Data were pooled from three experiments. Data are expressed as mean ± SEM by a Student t test. Data represent three independent experiments with at least three mice per group (A–F). The log-rank (Mantel–Cox) test was used to evaluate the survival rate (I). *p < 0.05, **p < 0.01, ***p < 0.001, ****p < 0.0001. ns, not significant. Liver NK cells can be divided into two distinct subsets based on the cell surface expression of CD49a and DX5: CD49a+DX5− and CD49a−DX5+ NK cells and liver resident CD49a+DX5− NK cells have been reported to possess memory potential and to confer hapten-specific CHS responses upon hapten rechallenge (5, 32). To determine which subset of liver NK cells possessed immune memory function after influenza virus infection, we compared the phenotype and function of CD49a+DX5− and CD49a−DX5+ liver NK cells. The results showed that the expression of KLRG1 and Ly6C was significantly increased on CD49a+DX5− liver NK cells but not on CD49a−DX5+ liver NK cells 30 d after PR8 infection (Fig. 3A, 3B), suggesting that the CD49a+DX5− NK cell subset might be the main source of memory-like NK cells in the liver. To address this hypothesis, the expression of IFN-γ in CD49a+DX5− liver NK cells and CD49a−DX5+ liver NK cells was analyzed after stimulating with inactivated PR8 or inactivated RSV. The results showed that CD49a+DX5− liver NK cells but not CD49a−DX5+ liver NK cells from PR8-infected mice expressed higher levels of IFN-γ than liver NK cells from control mice stimulated with inactivated PR8 (Fig. 3C), and there was no difference between them after stimulating with inactivated RSV (Fig. 3D). Furthermore, we sort-purified CD49a+DX5− liver NK cells and CD49a−DX5+ liver NK cells (Supplemental Fig. 2B) and then measured genes involved in immune memory and observed that the expression of homeobox-only protein (Hopx), which upregulated in memory cells and might promote the maintenance of memory NK cells after MCMV infection (28, 33), in CD49a+DX5− liver NK cells was much higher than in CD49a−DX5+ liver NK cells (Fig. 3E). Thus, these results suggest that CD49a+DX5− liver NK cells have more potential as memory-like NK cell candidates than CD49a−DX5+ liver NK cells. To further measure the immune memory function of both subsets, we adoptively transferred CD49a+DX5− liver NK cells and CD49a−DX5+ liver NK cells from PR8-infected mice into naive adult Rag1−/− mice or neonatal C57BL/6 mice followed by infection with a lethal dose of PR8 1 or 30 d later (Fig. 3F). We detected viral titers in the lungs 4 d after PR8 infection and observed that only the CD49a+DX5− liver NK cell transfer significantly decreased the viral load in the lungs of recipient Rag1−/− mice infected with PR8 both 1 and 30 d after adoptive transfer (Fig. 3G, 3H). Moreover, CD49a+DX5− liver NK cells but not CD49a−DX5+ liver NK cells from PR8-infected mice could protect recipient mice infected with PR8 at day 30 after adoptive transfer (Fig. 3I). Altogether, these results demonstrate that liver CD49a+DX5− NK cell is the primary source of memory NK cells against influenza virus. CD49a+DX5− liver NK cells express high levels of memory markers and inhibit influenza virus proliferation. (A–D) C57BL/6 mice were i.n. infected with 0.05 HA of PR8. After 30 d, the expression (A) and the percentage (B) of memory markers (Ly6c and KLRG1) on liver DX5+ NK cells and liver DX5− NK cells were determined by flow cytometry. The expression of IFN-γ in NK cells was determined by flow cytometry after stimulating with inactivated PR8 (C) and inactivated RSV (D). (E) The level of the memory-specific gene (Hopx) in liver DX5+ NK and DX5− NK cells from control mice or PR8-infected C57BL/6 mice was detected by real-time PCR. (F–H) Schematic of the experimental design. 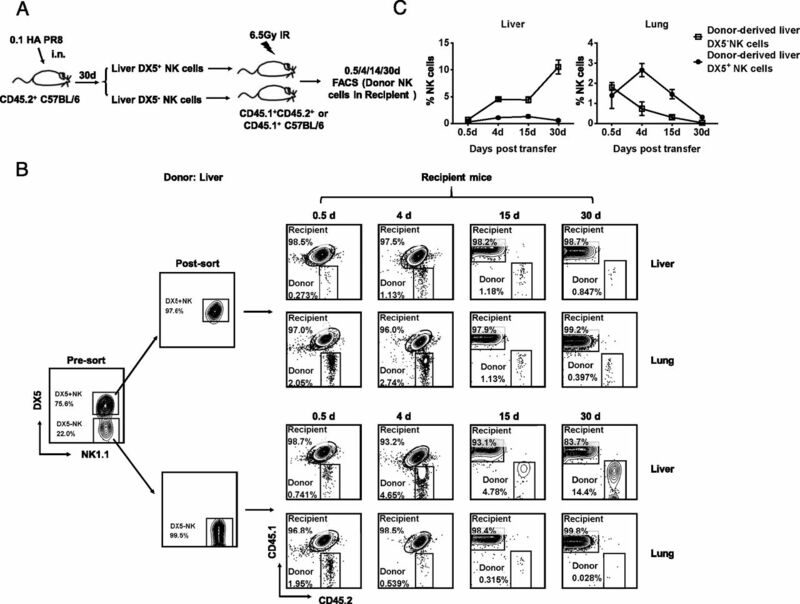 Liver DX5+ NK cells and DX5− NK cells from control mice or PR8-infected C57BL/6 mice were adoptively transferred into Rag1−/− mice, and recipient Rag1−/− mice were subsequently infected with a lethal dose of influenza virus 1 d later (G) or 30 d later(H). The viral titer in the lung of recipient Rag1−/− mice was detected 4 d after PR8 infection by MDCK determination assay. (I) Liver DX5+ NK cells and DX5− NK cells from control mice or PR8-infected C57BL/6 mice were adoptively transferred into neonatal C57BL/6 mice (7–10 d), and then the recipient mice were infected with a lethal dose of influenza virus 30 d later as shown in the schematic of the experimental design in (F). Survival rate of recipient mice was analyzed. Data are expressed as mean ± SEM by a Student t test. The data represent three independent experiments with at least three mice per group (A–H). The log-rank (Mantel–Cox) test was used to evaluate survival rate. Data were pooled from two experiments. *p < 0.05, **p < 0.01. ns, not significant. Next, to explore the mechanism of how CD49a+DX5− liver NK cell transfer protects recipient mice against influenza-induced death, we i.v. transferred CD49a+DX5− liver NK cells or CD49a−DX5+ liver NK cells from PR8-infected CD45.2+ C57BL/6 mice into sublethally irradiated CD45.1+ or CD45.1+CD45.2+ C57BL/6 mice and then detected the dynamic change of donor NK cells in the lung and liver of recipient mice (Fig. 4A). The results showed that both donor-derived DX5− and DX5+ NK cells mainly existed in the lung a short time after adoptive transfer and then decreased gradually. Interestingly, as time goes on, the donor-derived DX5− NK cells gradually increased in the liver whereas the donor-derived DX5+ NK almost had no increase (Fig. 4B, 4C). Therefore, these results would explain why CD49a+DX5− liver NK cells, but not other NK cells including lung NK cells and CD49a−DX5+ liver NK cells, provided protection against influenza virus infection in recipient mice. CD49a+DX5− liver NK cells accumulate and amplify in liver of recipient mice after adoptive transfer. (A–C) Schematic of experimental design. A total of 1 × 105 liver DX5+ NK and DX5− NK cells were sorted from PR8-infected CD45.2+ C57BL/6 mice and adoptively transferred into sublethally irradiated CD45.1+CD45.2+ C57BL/6 or CD45.1+ C57BL/6 mice i.v. (A). The dynamic change of NK cells in the lung and liver from recipient mice were analyzed at the indicated time points (12 h, 4 d, 15 d, 30 d) after transfer by flow cytometry (B and C). Data are expressed as mean ± SEM by a Student t test. The data represent two independent experiments with at least three mice per group. Previous studies have shown that hapten and HSV-2 induce the generation of memory-like NK cells in a T cell– and B cell–independent manner (1, 7). To determine whether memory-like NK cell generation after influenza virus infection depended on T and B cells, we i.n. infected Rag1−/− mice that lack T and B cells with a nonlethal dose of PR8 and subsequently assessed the phenotype of NK cells in the lungs and livers 30 d postinfection. Consistent with findings in C57BL/6 mice, NK cells in Rag1−/− mice also showed increased KLRG1 expression 30 d after PR8 infection (Fig. 5A–C). Importantly, the expression of both KLRG1 and Ly6C was also markedly increased on CD49a+DX5− liver NK cells but not on CD49a−DX5+ liver NK cells in Rag1−/− mice (Fig. 5C). Next, to determine whether primary influenza virus infection–induced memory-like NK cells in Rag1−/− mice could protect mice against secondary influenza virus infection, we i.n. infected Rag1−/− mice with a lethal dose of PR8 30 d after primary PR8 infection. 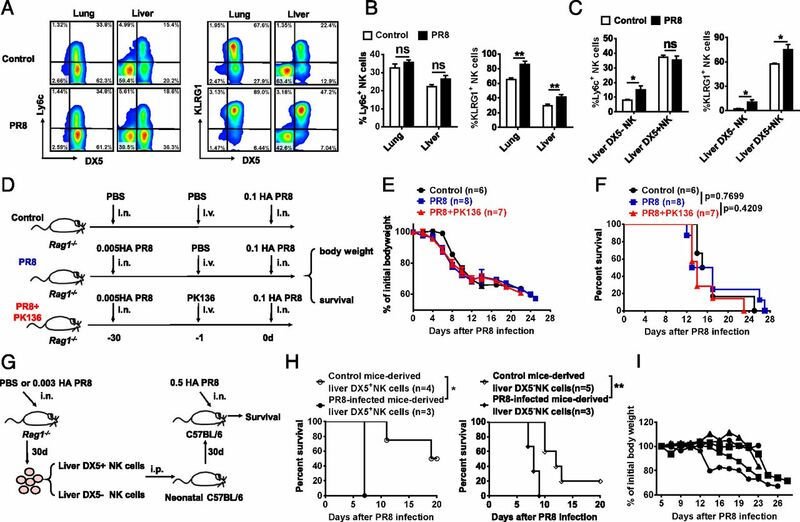 However, we observed that primary PR8 infection–induced memory-like NK cells could not protect Rag1−/− mice against death and weight loss caused by a secondary lethal dose of PR8 infection, and the depletion of NK cells using an anti-NK1.1 Ab (PK136) prior to secondary PR8 infection did not influence survival when compared with the untreated group (Fig. 5D–F). Further studies showed that both CD49a+DX5− liver NK cells and CD49a−DX5+ liver NK cells from PR8-infected Rag1−/− mice not only failed to protect recipient mice against influenza-caused death but also promoted the death of the recipient mice after influenza virus infection (Fig. 5G, 5H). Thus, these data suggest that influenza virus infection could not induce the production of the memory NK cells in Rag1−/− mice. We thought the reason was that, unlike in WT mice, PR8 primary infection resulted in persistent weight loss and worsened conditions in Rag1−/− mice (Fig. 5I), likely resulting from the lack of T and B cells to completely eliminate the virus or the loss of tolerance to infection-induced tissue damage (34). NK cells from Rag1−/− mice cells do not possess memory functions after primary influenza virus infection. (A) Rag1−/− mice were i.n. infected with 0.005 HA of PR8. After 30 d, the expression of memory markers (Ly6c and KLRG1) on NK cells from the lung and liver was determined by flow cytometry. (B) The frequencies of Ly6c+ and KLRG1+ NK cells in the lung and liver NK cells (CD3−NK1.1+) were analyzed. (C) The frequencies of Ly6c+ and KLRG1+ NK cells in liver DX5+ and DX5− NK cells were analyzed. (D–F) Schematic of experimental design. Rag1−/− mice were i.n. infected with 0.005 HA of PR8. After 30 d, mice were i.n. infected with 0.1 HA of PR8 after anti-NK1.1 Ab (PK136) treatment or not (D). The bodyweight change (E) and the survival rates (F) of Rag1−/− mice were monitored after subsequent influenza virus infection. (G and H) Schematic of experimental design. Liver DX5+ and DX5− NK cells isolated from control or PR8-infected Rag1−/− mice were adoptively transferred into neonatal C57BL/6 mice (7–10 d), and the recipient mice were subsequently infected with a lethal dose of influenza virus 30 d later (G). Survival rate of recipient mice was monitored (H). (I) Rag1−/− mice were i.n. infected with 0.005 HA of PR8. Changes in body weight was analyzed. Data are expressed as mean ± SEM by a Student t test. Data represent three independent experiments with at least three mice per group in (A–C). The log-rank (Mantel–Cox) test was used to evaluate survival rate (D–H). Data were pooled from two experiments. *p < 0.05, **p < 0.01. ns, not significant. To control the influence of primary influenza virus infection, we treated Rag1−/− mice s.c. with inactivated PR8 as a primary immunization according to a previous report (2) and then infected mice i.n. with a lethal dose of PR8 30 d later (Fig. 6A). The results showed that primary inactivated PR8 treatment protected Rag1−/− mice against secondary PR8 infection–induced death and decreased the viral titer in the lungs when compared with the control group; in addition, the depletion of NK cells using an anti-NK1.1 Ab prior to secondary influenza virus infection significantly decreased the survival rate of Rag1−/− mice and increased the viral titer in the lungs after secondary PR8 infection (Fig. 6B, 6C). Furthermore, adoptive transfer of CD49a+DX5− liver NK cells but not CD49a−DX5+ liver NK cells from inactivated PR8-treated Rag1−/− mice could reduce the viral titer in recipient mice (Fig. 6D, 6E). Moreover, to further determine whether CD49a+DX5− liver NK cells in Rag1−/− mice perform a protective effect, we used Rag1−/−Nfil3−/− mice in which CD49a+DX5− NK cells are dominant in liver and Rag1−/−Tbx21−/− mice that lack CD49a+DX5− liver NK cells as the study objects. The results showed that inactivated PR8 priming could significantly reduce viral titer after secondary influenza virus infection in Rag1−/−Nfil3−/− mice rather than in Rag1−/−Tbx21−/− mice (Fig. 6F, 6G). Taken together, these results suggest that primary influenza virus treatment protects Rag1−/− mice against secondary influenza virus infection–induced death through inducing memory-like NK cell generation in a T cell– and B cell–independent manner. Inactivated PR8 treatment inhibits viral proliferation and protects mice against secondary influenza-induced death. (A–C) Schematic of experimental design. The inactivated PR8 treated Rag1−/− mice by s.c. immunization at day −30 and −25. At day 0, Rag1−/− mice were i.n. infected with activated PR8 after anti-NK1.1 Ab (PK136) treatment or not (A). Survival rates of Rag1−/− mice after activated PR8 infection (B). Viral titer in the lung was detected at day 4 and 7 after activated PR8 infection (C). (D and E) Schematic of experimental design. Liver DX5+ and DX5− NK cells isolated from control or inactivated PR8 immunized Rag1−/− mice were adoptively transferred into naive Rag1−/− mice, and then the recipient Rag1−/− mice were infected with a lethal dose of influenza virus 1 d later. Viral titers in the lung of recipient mice were detected at day 4 after PR8 infection (E). (F) Flow cytometry assay determined the CD49a+DX5− NK cells and CD49a−DX5+ NK cells in the liver of Rag1−/− Nfil3−/− mice and Rag1−/− tbx21−/− mice. (G) Rag1−/− Nfil3−/− mice and Rag1−/− tbx21−/− mice immunized with inactivated PR8 and then challenged with activated PR8 30 d later. Viral titers in the lung were detected at day 4 after activated PR8 infection. Data are expressed as mean ± SEM by a Student t test. The log-rank (Mantel–Cox) test was used to evaluate survival rate. Data were pooled from three experiments (B). Data represent three independent experiments with at least three mice per group(C–G). *p < 0.05, **p < 0.01. ns, not significant. Immune memory is a classical feature that distinguishes innate and adaptive immunity. However, the finding of memory-like NK cells might obscure the concept of innate and adaptive immune systems (35, 36). In the past several years, memory-like NK cells have been studied using various mouse models (37, 38). However, whether NK cells mount an Ag-specific memory response after influenza virus infection has not yet been examined. In the current study, we used a well-established mouse model of respiratory influenza virus infection to characterize Ag-specific memory-like NK cells, and we observed that lung NK cells possess a memory-like phenotype but do not protect mice against secondary influenza virus infection. Further studies showed that liver-resident CD49a+DX5− NK cells also display a memory-like phenotype and protect mice against influenza virus reinfection. Thus, consistent with the results from studies using noninfectious influenza virus particles, memory-like NK cells are observed in vivo after active influenza virus infection, thereby providing an adequate platform to investigate the mechanisms underlying the generation, migration, and function of memory-like NK cells. Influenza virus–specific memory-like NK cells share several characteristics with MCMV-specific memory NK cells (4) and hapten-specific memory NK cells (1, 2). Similar to MCMV-specific memory NK cells, influenza virus–specific memory-like NK cells also upregulate expression of the receptors KLRG1 and Ly6C and the transcription factor Hopx. Consistent with findings in previous studies concerning hapten-specific memory NK cells, influenza virus–specific memory-like NK cells reside in the liver and display a CD49a+DX5− phenotype. Although influenza virus–specific memory-like NK cells have been detected after active influenza virus infection, several questions remain. For example, what kinds of ligand and receptor interactions induce the generation of memory-like NK cells? Why do influenza virus–specific memory-like NK cells reside in the liver but not in the lung? In studies of MCMV-specific memory NK cells (4), Sun et al. demonstrated that the interaction between the Ly49H receptor on NK cells and the glycoprotein m157 from MCMV mediates the generation of MCMV-specific memory NK cells. However, although the activating receptor NKp46 binds to the influenza protein HA (39), Silke Paust and colleagues showed that HA was not required for NK cell–mediated recall responses to influenza virus-like particles (2). Moreover, in the current study, we observed that influenza virus–specific memory-like NK cells reside in the liver but not in the lung. So, we speculated that the generation of influenza virus–specific memory-like NK cells in the current study might depend on the interaction between other ligands and receptors from influenza virus and NK cells, respectively, and Ag ligands from influenza virus might enter the liver through the bloodstream, although influenza virus could not be detected in the liver during infection (40). The generation of MCMV-specific memory NK cells requires simultaneous stimulation from both specific Ags and proinflammatory cytokine signaling, and the clonal expansion of Ly49H+ NK cells following MCMV infection is dependent on IL-12 and STAT4 signaling (41). The key NK cell survival factor IL-15 is critical to the maintenance of the memory NK cell population (42). Increased cytokine expression is induced during influenza virus infection (31, 43, 44), and these proteins can enter the liver through the bloodstream. According to the findings in other memory-like NK cell studies, the generation of influenza virus–specific memory-like NK cells might also need the cytokine stimulation. The results of a previous study showed that chemical hapten-induced memory NK cells reside in the liver, and chemokine receptor CXCR6 on NK cells mediates the migration of NK cells into the liver (2). However, we previously showed that liver-resident CD49a+DX5− NK cells mediate hapten-specific recall responses, and CD49a+DX5− NK cells rarely circulate or emigrate from the liver (5, 45). In addition, CD49a+DX5− liver NK cells differentiate from liver-resident hepatic progenitor cells and sense Ags in the liver and acquired memory function locally. Thus, the liver may have unique precursors for memory NK cells, and they are developmentally distinct from NK cells derived from bone marrow (45). Thus, how haptens stimulate CD49a+DX5− NK cells and how CD49a+DX5− NK cells exert recall responses outside the liver remain unknown. In the current study, we also observed that liver-resident CD49a+DX5− NK cells mediate memory effector functions, although lung NK cells also display a memory-like phenotype. However, whether CXCR6 plays a role in the generation of influenza-specific memory-like NK cells needs further study. Although the specific phenotype of memory-like NK cells remains unknown, the upregulation of Ly6C and KLRG1 expression and the downregulation of CD62L expression could indicate memory-like NK cells, according to previous studies of MCMV-specific memory NK cells (28). 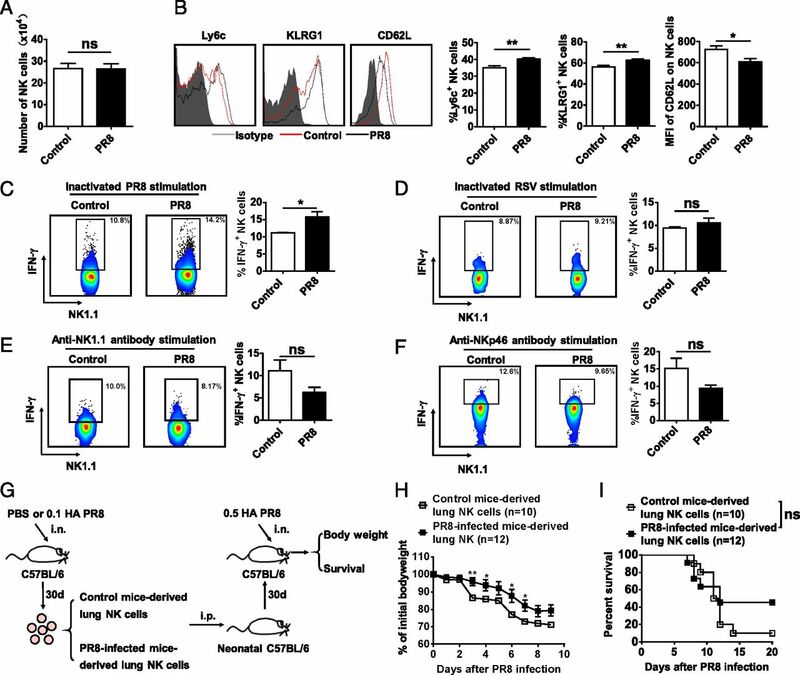 In the current study, we observed that, at the late stages of influenza virus infection, both lung and liver NK cells upregulate Ly6C and KLRG1 expression and downregulate CD62L expression, and both lung and liver NK cells from influenza virus–infected mice express higher levels of IFN-γ after stimulation through inactivated influenza virus in vitro compared with NK cells from noninfected mice. However, the adoptive transfer of liver CD49a+DX5− NK cells, but not lung NK cells or liver CD49a−DX5+ NK cells, protected recipient mice against influenza virus infection. However, why lung NK cells display a memory-like phenotype but fail to protect mice against influenza virus infection remains unanswered. We speculate that the concentration of inflammatory cytokines determines the effector function of memory-like NK cells. The concentration of inflammatory cytokines in the liver but not in the lung is optimal for memory-like NK cell generation. As reported in previous memory T cell studies (46–49), strong stimulation and excessive activation are not suitable for the generation and function of memory T cells. Thus, the cytokine concentration in the lung during influenza virus infection might be too high for memory-like NK cell generation. Consistent with previous studies (1, 6, 7), the generation of influenza-specific memory-like NK cells in the current study was also independent of T and B cells. We used Rag1−/− mice that naturally lack T and B cells to study the function of memory-like NK cells after active influenza virus infection. However, although we observed memory-like NK cells in Rag1−/− mice at the late stage of influenza virus infection, these cells did not protect mice against secondary influenza virus infection. In contrast with WT mice, primary influenza virus infection resulted in persistent weight loss and worsening conditions in Rag1−/− mice, as these mice lack the adaptive immunity of T and B cells to completely eliminate viruses. Moreover, as reported in previous memory T cell studies (46–49), strong and persistent stimulation are not suitable for the generation and function of memory T cells, so the condition in Rag1−/− mice after influenza virus infection might be not suitable for the production of memory NK cells. Otherwise, one study showed that RAG-deficient NK cells exhibit a cell-intrinsic hyperresponsiveness and a diminished survival capacity after virus stimulation as a result of reducing expression of DNA damage response mediators and defects in the repair of DNA breaks (50), which might be another reason why memory NK cells could not be detected in Rag1−/− mice after influenza virus infection. To further explore this idea, we used inactivated influenza virus to immunize Rag1−/− mice and observed that memory-like NK cells decreased the viral titer during secondary active influenza virus infection. Our study provides another adequate platform to investigate the mechanisms underlying the generation, migration, and function of memory-like NK cells. Studies to reveal the mechanisms for NK cell memory may lead to the potential use of a vaccine that specifically induces protective memory NK cells, which would provide a new strategy to protect humans against influenza virus infection. We thank Dr. Tak W. Mak for providing the Nfil3+/− mice. We thank H. Meng (Shandong Academy of Medical Sciences) for the influenza A/PR/8/34 strain. We thank Jinsheng He (Department of Immunology, Anhui Medical University) for providing the long strain of RSV. This work was supported by Ministry of Science and Technology of China 973 Basic Science Project Grants 2013CB944902 and 2013CB530506 and National Natural Science Foundation of China Grants 81361120388, 31400783, 91542114, 31300727, and 31300753.
. 2009. Cytokine-induced memory-like natural killer cells. Proc. Natl. Acad. Sci. USA 106: 1915–1919.
. 2013. Liver-resident NK cells confer adaptive immunity in skin-contact inflammation. J. Clin. Invest. 123: 1444–1456.
. 2011. Thy1+ NK [corrected] cells from vaccinia virus-primed mice confer protection against vaccinia virus challenge in the absence of adaptive lymphocytes. [Published erratum appears in 2011 PLoS Pathog. 7.] PLoS Pathog. 7: e1002141.
. 2012. Genital HSV-2 infection induces short-term NK cell memory. PLoS One 7: e32821.
. 2015. Antigen-specific NK cell memory in rhesus macaques. Nat. Immunol. 16: 927–932.
. 2016. Sweet is the memory of past troubles: NK cells remember. Curr. Top. Microbiol. Immunol. 395: 147–171.
. 2016. Natural killer cell memory in infection, inflammation and cancer. Nat. Rev. Immunol. 16: 112–123. 2004. Interplay of natural killer cells and their receptors with the adaptive immune response. Nat. Immunol. 5: 996–1002.
. 2015. NK cell receptor imbalance and NK cell dysfunction in HBV infection and hepatocellular carcinoma. Cell. Mol. Immunol. 12: 292–302.
. 2011. Immunity to seasonal and pandemic influenza A viruses. Microbes Infect. 13: 489–501.
. 2007. A question of self-preservation: immunopathology in influenza virus infection. Immunol. Cell Biol. 85: 85–92.
. 2007. The trafficking of natural killer cells. Immunol. Rev. 220: 169–182.
. 2012. Lung natural killer cells in mice: phenotype and response to respiratory infection. Immunology 137: 37–47.
. 1986. In vivo treatment of mice and hamsters with antibodies to asialo GM1 increases morbidity and mortality to pulmonary influenza infection. J. Immunol. 136: 1435–1441.
. 2004. Interleukin-18 improves the early defence system against influenza virus infection by augmenting natural killer cell-mediated cytotoxicity. J. Gen. Virol. 85: 423–428.
. 2006. Lethal influenza infection in the absence of the natural killer cell receptor gene Ncr1. Nat. Immunol. 7: 517–523.
. 2012. Critical role of natural killer cells in lung immunopathology during influenza infection in mice. J. Infect. Dis. 206: 167–177.
. 2013. NK cells exacerbate the pathology of influenza virus infection in mice. Eur. J. Immunol. 43: 929–938.
. 2015. Influenza vaccine induces intracellular immune memory of human NK cells. PLoS One 10: e0121258.
. 2006. Poly I:C prevents T cell-mediated hepatitis via an NK-dependent mechanism. J. Hepatol. 44: 446–454.
. 2005. Role of tumor necrosis factor-related apoptosis-inducing ligand in immune response to influenza virus infection in mice. J. Virol. 79: 7658–7663.
. 2009. 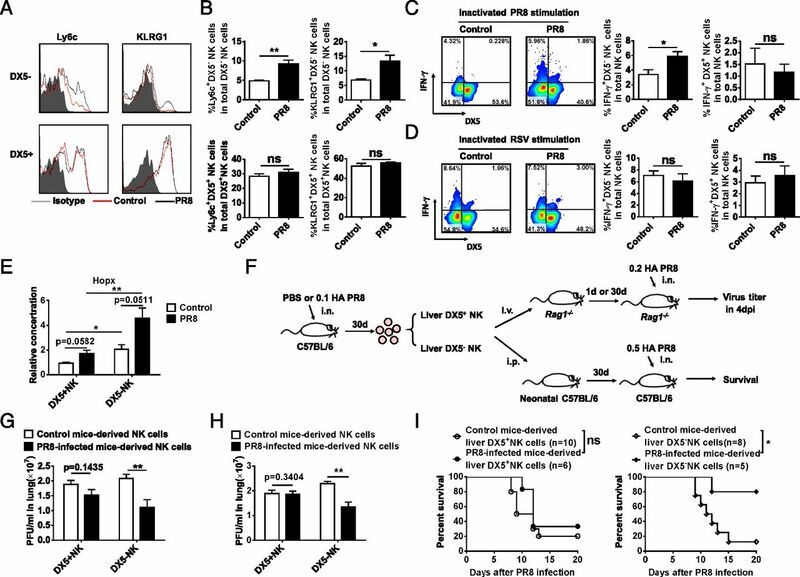 Nfil3/E4bp4 is required for the development and maturation of NK cells in vivo. J. Exp. Med. 206: 2977–2986.
. 2011. NK cells and immune “memory”. J. Immunol. 186: 1891–1897.
. 2012. Molecular definition of the identity and activation of natural killer cells. Nat. Immunol. 13: 1000–1009.
. 2012. Memory CD4+ T cells protect against influenza through multiple synergizing mechanisms. J. Clin. Invest. 122: 2847–2856.
. 2000. The role of alpha/beta and gamma interferons in development of immunity to influenza A virus in mice. J. Virol. 74: 3996–4003.
. 2012. Activation mechanisms of natural killer cells during influenza virus infection. PLoS One 7: e51858.
. 2016. Liver natural killer cells: subsets and roles in liver immunity. Cell. Mol. Immunol. 13: 328–336.
. 2010. Persistence of effector memory Th1 cells is regulated by Hopx. Eur. J. Immunol. 40: 2993–3006.
. 2013. Role of tissue protection in lethal respiratory viral-bacterial coinfection. Science 340: 1230–1234.
. 2009. Natural killer cells remember: an evolutionary bridge between innate and adaptive immunity? Eur. J. Immunol. 39: 2059–2064.
. 2013. Natural killer cells: walking three paths down memory lane. Trends Immunol. 34: 251–258.
. 2014. Respiratory influenza virus infection induces intestinal immune injury via microbiota-mediated Th17 cell-dependent inflammation. [Published erratum appears in 2014 J. Exp. Med. 211: 2683.] J. Exp. Med. 211: 2397–2410.
. 2012. Proinflammatory cytokine signaling required for the generation of natural killer cell memory. J. Exp. Med. 209: 947–954.
. 2013. Nfil3-independent lineage maintenance and antiviral response of natural killer cells. J. Exp. Med. 210: 2981–2990.
. 2007. Keeping NK cells in highly regulated antiviral warfare. Trends Immunol. 28: 252–259.
. 2016. The cytokine storm of severe influenza and development of immunomodulatory therapy. Cell. Mol. Immunol. 13: 3–10.
. 2013. Memory NK cells: why do they reside in the liver? Cell. Mol. Immunol. 10: 196–201. 2001. Assessing CD8 T cell number and dysfunction in the presence of antigen. J. Exp. Med. 193: F19–F22.
. 2003. Ablation of CD8 and CD4 T cell responses by high viral loads. J. Immunol. 170: 477–486.
. 2016. Effective intrahepatic CD8+ T-cell immune responses are induced by low but not high numbers of antigen-expressing hepatocytes. Cell. Mol. Immunol. 13: 805–815.
. 2014. The RAG recombinase dictates functional heterogeneity and cellular fitness in natural killer cells. Cell 159: 94–107.